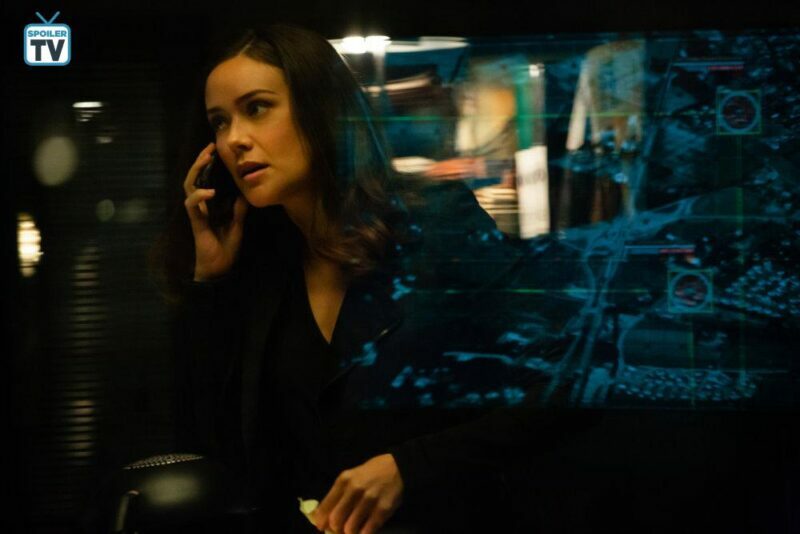 Megan Boone in ‘The Blacklist.’ Image courtesy of IMDb.com. This episode begins with what seems to be an accident and a man is pulling woman’s body away from the scene. He hides her bike in his trunk and gets back in his car and drives off. The windshield has been cracked where she impacted the car. Next, we see the same man at a conference giving a speech. He plans to open “Chione” a distributing facility in Malaysia. We find out the man’s name is Mr. Tamerlane, and he is approached by a man who questions him about the accident of the girl at Rock Creek Park. The man warns Tamerlane that he could be in real trouble and he isn’t the only one with knowledge of the crime. He also tells Tamerlane that he might have to face witnesses and a grand jury. The strange man gives Tamerlane his business card. We now enter the courtroom where Raymond’s trial is about to begin, but he insits that he isn’t ready. Raymond raises the idea that his criminal activities may have been the result of his “mental abnormalities” and he would like to look into it before proceeding. The prosecutor, Mr. Sima disagrees and suggests that Reddington isn’t crazy as he was sane enough to try and persuade Judge Wilkins to uphold his immunity agreement. Reddington continues and says that Mr. Sima’s opinion isn’t fact and that it is his right to find out about his mental health. Liz is seen on the phone with her sister Jennifer as they discuss Raymond being out of town due to the judge granting him the right to a psychiatric evaluation in Missouri. Liz says that he needs to see a man in Missouri instead of getting checked out. We see that the conversation Liz has with Reddington and why he needs the evaluation if not for his mental health. Jennifer says that their case has hit a dead end because they aren’t able to speak to Koehler’s patient who might be able to identify the real Red. Liz suggests that they ask the task force for help, since Reddington didn’t give them a real case. Liz plans to pretend that the case is from Red when in fact, it’s from her and Jennifer. Liz briefs the task force on Gerald Todd Klepper who murdered 17 patients in Newark. Klepper changed his appearance by Hans Koehler. Liz says that Reddington said Klepper was a “special case” but didn’t say why, and he is unable to provide answers as he is getting a psych eval. Liz says that they need to start with his ID because they have no idea where he lives or what he looks like. While the team discusses, we see Tamerlane meet the strange man who approached him in the RV park, as the contact card stated. Liz voices that the only thing they have on Klepper was that he was on dialysis before his surgery but when a P.I. was hired to investigate further, they didn’t find anything that could place his whereabouts or identity. Liz and Ressler meet with the P.I. who has been working the case since 1994. The P.I. said that the police had it wrong about Klepper-he targeted patients because they wanted to live and would undergo aggressive treatments- he didn’t put people out of their misery. Aram finds out information as to why Klepper would stay in one place for three months. He had a kidney transplant in Philadelphia in 2010 and Aram narrowed it down all the white men-around the same age and race who would have matched the description. He pulled up a man named Cameron Morella. Morella didn’t exist before 2010. They determine this is Klepper’s new identity and our blacklister. Aram discovers that Klepper is in D.C. and that he purchased hotel room less than an hour ago. We see Morella (or rather Klepper) visit Miss Carter- the witness to Tamerlane’s crime. He claims he is from the District Attorney’s office. Miss Carter seems confused, as a woman from the District Attorney’s office said Carter wouldn’t be making a statement until later that day. Klepper, seen putting on black gloves tells her that he is in fact not from the DA but he is there on behalf of Mr. Tamerlane. Miss Carter gets angry as she states that he can’t send people to buy her out for what she saw him do to that girl. Klepper assures her that it’s not quite what he is there for, and she tries to run but he attacks her. He brings her into the bathroom and slams her head on the counter, which leaves her bleeding out on the floor. He turns on the water in the shower and removes her clothes to make it look like she slipped. Reddington is being seen by the psychiatrist at his eval. She says that after reading the transcript, she feels he is a competent and capable to be held liable in court. Red tells her that he doesn’t really understand why he is in court, he did what he thought was “just” and even gives her examples on how people die all the time; speed limits, polluted waters, etc. The doctor decides she is going to administer some diagnostic tests. Keen and Ressler arrive at the scene of Klepper’s crime against Miss Carter. Keen and Ressler look at the body and know that it wasn’t just a slip and fall. Ressler asks the officer to lock down the building and that Morella/Klepper is on the loose. Reddington seems very concerned and really desperate. A nurse overhears and walks over to tell Red that Mr. Rodrick won’t speak because of all the medication he is on. She says that he is a bear if he doesn’t get his medication every three hours. Reddington gives a patient his medications to organize by color and walks over to Atticus and the bird habitat. Trying to distract the nurse, he says that one of the birds is endangered and should be in its own cage. As he does this and she turns away to look at the cage, he switches out some of Atticus’ pills . After successfully changing them, he says that the bird should be fine as he identified the wrong species. He sits down next to Atticus and says that he is going to sober him up so he can tell Reddington where the man is that Red is looking for. Liz and Ressler are talking with the team back at the task force headquarters and tells them that Klepper wasn’t seen on any cameras, and that he only purchased the hotel room to get access to Carter’s room. Ressler tells Keen that the DA was paying for the victim’s room because she is a key witness in a case against Digby Tamerlane. The team decides Klepper’s motive for killing her which is his cross-benefit analysis and it seems that Digby’s life was more valuable than Miss Carter’s. Cooper instructs Ressler and Keen to investigate Tamerlane. Liz is shown questioning Tamerlane as he claims he doesn’t know Kelly Carter and has never seen Cameron Morella before. He requests his lawyer but Liz persists. She tells him that Kelly is the witness who saw him try to hide the body of the 12 year old little girl and that (little did he know) Morella is a serial killer. Liz promises to drag Tamerlane down since she knows they were doing business together. Digby starts talking and says he was approached after the announcement of the Malaysia plant. They met at his place but Tamerlane also had his phone number which he gave Liz. 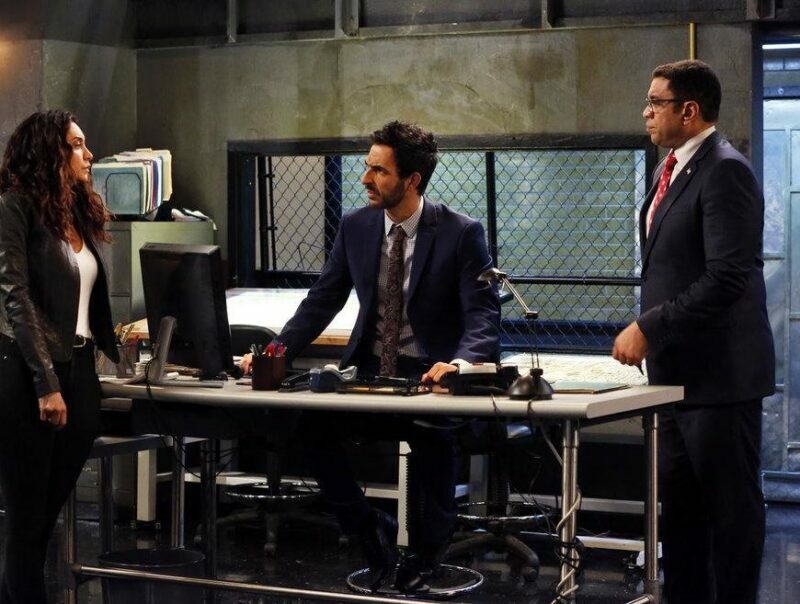 Keen gives the number to Ressler for Aram to trace so they can find Klepper. Keen goes into her office and makes a call to Jennifer. Liz gives Jennifer the number for her friend Buck to trace. Liz gave Ressler and Aram the wrong phone number to trace so that Liz and Jennifer can find Klepper first. Reddington talks to Atticus and explains why Atticus is there. Atticus is confused and getting angrier and angrier as Reddington tries to press him for the whereabouts of the associate. Dr. Gray comes and tells Raymond that he is late for their session when Atticus attacks her. Red tries to restrain him but the other nurses take over. Jennifer calls Liz back and says that her friend Buck got a location off the phone number. Ressler comes in with news that the phone number was a dead end and Cooper wants him and Keen to head to the campground. Liz says she can’t go because she is going to try to talk to Reddington even though he is in a psych facility. Ressler credits Keen on dealing with Red because of the all the things he hides behind their backs. She says it isn’t easy but he says she makes it look like it is. Liz tells Ressler she will let him know what she finds out. Liz arrives at the location of Klepper’s phone. Liz bangs on the door for him to open and if not, a team will storm the vehicle. He opens the door and she shoos him away from the door and enters the RV. A nurse is administering medication to Atticus to sedate him but when she walks away, he tries to get his attention. Red says that the friend has an assassination job but the FBI is looking for him. Red needs to know who the friend would turn to in order to get a job done quietly. Atticus is very zoned out and keeps saying he would like to fly but he does give Red a name: General Shiro. Liz is holding her gun on Klepper and tells him she knows his true identity. Klepper claims that he doesn’t know what she is insinuating when there is a knock at the door. Jennifer walks in with Koehler’s file on Klepper and he starts talking. Jennifer tells him that they want to know who Raymond Reddington is since they were patients around the same time. Klepper says that they remained anonymous and that was why they all went to Koehler and that they never saw each other. Liz receives a call from Ressler and Navabi as they are on their way to Third and Sycamore from a tip someone gave them on the description of Klepper’s RV. Ressler asks her about Red and he says that he didn’t know anything. Liz continues with Klepper and asks him if he didn’t see Reddington, who did? Klepper says a nurse saw all the patients before and after their transformation. They ask for the name but he starts getting into statistics that his life is not as valuable as Keen’s and that she needs to kill him. The only way that her life and job can remain valuable is if Ressler and Navabi never find out about this meeting at all. He plans on killing himself. Klepper doesn’t want to live his life behind bars so he needs to plan his suicide making it look like another statistic. Liz tells Jennifer to leave and Liz hands him the gun, as it is the only way to get the nurse’s name. He gives her the name Marguerite Renard. Liz leaves and he says, “It’s the ethical thing to do.” Liz gets back in the car with Jennifer and they drive away from the scene as sirens are heard. Ressler and Navabi arrive on the scene as the we see Klepper dead in his RV, with the gun in his hand. Back at the office, Keen approaches Ressler and says she heard about Klepper. She says that he probably didn’t want a life in prison and found it better to kill himself. Ressler says that he found Klepper’s burner phone and the number that Liz gave him was wrong. He says that she wanted to get to him first for another agenda and led them in the wrong direction. He also checked to see if she called Red and she hasn’t which means he has no idea about the case. He knows that this is Liz’s case that she gave the task force. She told him to trust her because she can’t tell him anything right now. He asks if she killed Klepper, and she says no. She does tell him that she let Klepper kill himself because he convinced her that, “The benefit outweighed the cost.” She begs him not to say anything to Cooper about her secret case. The autopsy results come back for Klepper and Ressler tells Cooper it appeared to be a suicide. Cooper said that they found evidence in his trailer about his other ethical decisions about 14 murders. Ressler is visibly bothered by the fact that the cases they get always have an ulterior motive. Cooper says that a serial killer is dead and that he can’t hurt anyone else. Cooper questions Ressler if he suggests there might be something they missed, but Ressler says that the case is closed and there is nothing else to look for. Liz calls Jennifer and says that they have to find the nurse Marguerite Renard. Jennifer worries that Red and their investigation will persuade her to make decisions like the one made by Liz to allow Klepper to kill himself. They try to find what is known about her. Judge Wilkins received the decision and the doctor doesn’t think he is legally insane. Red does not contest the decision, allowing the judge and the prosecutors proceed. The first charge they want to file against Red is treason. Judge Wilkins says that a jury will be selected immediately. The Blacklist airs Fridays at 9 pm on NBC.